I would like to learn more about the traditions of kite building and flying. I am sure it is far deeper and more complex then I can imagine. 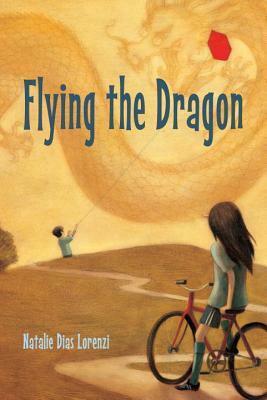 Reading Flying the Dragon by Natalie Dias Lorenzi has piqued my interest. Hiroshi and grandfather stand in the wind from Tachibana Bay flying their dragon kite. They kite they built together for Hiroshi’s first entry in the annual rokkaku kite battle. Finally old enough, Hiroshi will fly the kite this year, while grandfather minds the reel. Their kite is beautiful as they test it in the wind for the first time, excitement tingling down the line. Skye is a lead scorer on her team. She also has great vision on the field and knows how to pass and place the ball for her teammates to succeed. Finally she has been invited to be part of the all-star team. Skye plans to finish this season as strongly as she can so she’ll be ready for stiffer competition the new team will bring. Hiroshi has spent years preparing for this battle. He will take his place among the great kite fliers of his family. Skye has practiced for years to make the all-star team and now she has qualified. Hiroshi and Skye, one from Japan and one from Washington DC, are cousins. They are each 11. Their fathers are brothers, twins and eldest sons of the Tsaki family. Grandfather has cancer and it is decided that he will receive the best treatment in Washington DC. Hiroshi’s family will move. Skye’s family will help them adjust and care for grandfather. This means Hiroshi must leave his dream of winning the rokkaku battle behind and Skye must go to Japanese school on Saturdays rather than play for the all-star team. Hiroshi and Skye feel anger and resentment over their losses. They despise the changes they must make, but they love their wise and gentle grandfather. He loves his family and can see how challenging it is for them to make adjustments in their lives. Kites and the stories competitions and battles unite the generations. Grandfather uses them to extract a promise from them that they will form a team and enter the rokkaku competition held during the Cherry Blossom Festival on the Mall. The contrast between the tension and bitterness both cousins feel toward each other and in school learning new languages and new cultures and the ease and wonder they experience in the wind with the kite is striking. When the kite swoops and swirls higher with each breeze and gust it blows away the feelings of humiliation, failure and worry. Kites can’t do everything – will it be enough? There is much to love about Flying the Dragon. It reminds us of the importance of family, forgiveness and taking time to appreciate both traditions and new beginnings.